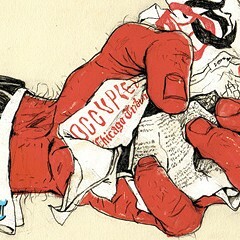 The Tribune's complaint that the domain names occupiedchicagotribune.org and occupychicagotribune.org infringe on the Chicago Tribune trademark, sew confusion, and should be turned over to the Tribune has been rejected by the Swiss-based international body that worries about these things. "The Occupy Movement is an international protest movement with a wide range of goals, one of which is to protest against the political and economic inequities that exist between the small fraction of highest-earning individuals in a society and its remaining members . . . . Given the circumstances of this case and in particular the heavy and nearly universal coverage of the Occupy Movement within the national and local media, the Panel holds that the Occupy Movement is so well known within the relevant area (both parties being from Chicago, Illinois, in the United States) that the Domain Names are not confusingly similar to Complainant’s mark. The Panel agrees with Respondent’s assertion that no reasonable person in the Chicago area would confuse the Domain Names with Complainant or Complainant’s publication." Here's a link to the entire six-page decision. The Tribune had filed a complaint against the Occupied Chicago Tribune newspaper and website in late May, arguing that it acquired the two domain names "in bad faith" and to "divert traffic" from Tribune websites. It asked the WIPO to transfer both sites to the Tribune. Here's my coverage of that complaint, and my coverage of the Occupiers' response. "This case goes to show that the corporate stranglehold on our politics and media can be successfully challenged and it will go down as an important precedent in protecting the internet freedom and free speech rights of independent and Occupy presses worldwide. It is our hope that now, following multiple failed attempts by the Tribune Company to infringe on our First Amendment rights and silence our publication—which have cost the company at least the $1,500 filing cost plus lawyer fees, that the Chicago Tribune will focus their energy and finances on keeping their journalists employed amidst their ongoing bankruptcy proceedings, the Journatic scandal and building their paywall."